We’re busy setting up taping dates for new acts and we’re scripting new IMT segments and taping those. We will also start setting dates for new In Concert Road Shows at some new locations. Any artists interested in being a part of these shows, please contact us. Tonight we’re premiering a new band, Amenti Rover. We met and taped them at the “Rock Out Hunger” event in Burlington Twp. a few weeks back. They’re an excellent rock band that put on a very enjoyable show. We have Mike & Flora from our Road Show at The Shamrock and Wendy Betz and the Riseing taped at The Bus Stop in Pitman, NJ. Then we return to the Medford Fireworks for an original from No Commitment. What a fantastic evening of music from these young artists. They have a great future ahead of them. August 10th Amenti Rover will return along with more from the Breast Cancer Fundraiser taped at Dr. Lou’s Place. More music from Riverz Edge Band, Ginger Coyle and Underground Rats rounds out the show. We appreciate the fact that these artists donated their time to perform for such a worthy cause. Next week I should have some upcoming dates for Road Shows and other events. 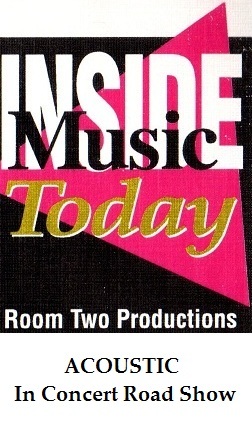 Room Two Productions is proud to present Inside Music Today’s very first In Concert Road Show! It’s an all-acoustic show at the Shamrock Pub in Philly. We’ll be there taping from 5 to 9 PM today. Why not come out and enjoy this concert in person? Then sit back and watch these talented bands’ best acoustic performances on future episodes of Inside Music Today! Our producer Bill will be sharing MC duties with Dr. Lou, and there are always surprises in store! See you this evening at the Shamrock Pub! Great show this week along with new IMT opportunities! Ian O’Grady has had to wait the longest of everyone from the 5-artist night at Dr. Lou’s Place, but his week has finally arrived. Thank you for your patience. Ian will also be performing another original on our very first In Concert Road Show. We have secured the Shamrock Pub in Center City Philly as our venue for our very first show. The remaining line-up and date will be announced after they are all locked in. Speaking of the Shamrock Pub, this week’s show features Dr. Lou performing one of his originals at that venue. We also have a second song from Cory Walters and If All Else Fails. We recorded so much music that night at Dr. Lou’s! Filling out the show, we have archival footage featuring George Spicer and Dream Catcher. Another fantastic night of music from the IMT early years. Watch this show NOW on YouTube! The February 23rd show is quite a mixture of music. Definitely something for everyone! On Sunday we headed over to Dr. Lou’s Place to enjoy the open mic night with Mike & Flora. They were happy to perform some original tunes written by Flora and we are featuring one of those songs on this show. Then unexpectedly their friend, SiriOm Singh, just happened to drop in on their open mic. He entertained us with one of his world music originals that we just had to record. We’ve been crossing the river a lot lately. From a Sunday when Dr. Lou and friends performed at the Shamrock Pub, we have another Dr. Lou song. Then just this past Wednesday, we crossed the Bristol Bridge and visited Pasquale’s Sports Bar. We were supposed to record Angel Casiano, but he had laryngitis. Angel, we hope you feel better! So we hung out and met Howard Durann who had brought his Bucks County Open Mic to Pasquale’s. We met many IMT fans and several artists that have been featured on the show. Then we enjoyed quite an evening of entertainment. Since we were prepared to record, some of the artists have been captured on our video. The band that will be featured on this show is Mindless Hope. Unbelievable harmony guitar work. We are so happy to showcase them to our IMT fans. As I’ve been saying since the new year, Inside Music Today is on the path to offer many new opportunities to our artists. Our new In Concert Road Show and the Bucks County Open Mic are just two possibilities of which artists can be a part. We will have more info about them both in upcoming blasts. Hope you all enjoy your weekend and Inside Music Today! Click on the SPONSORS tab to see who’s keeping us on the air, bringing original music to the Delaware Valley. Happy first day of autumn! This week’s show is a wonderful line-up of talent from years gone by, but the performances are still as remarkable as those years ago. Please enjoy these songs from the past, performed by these noteworthy artists. While these performers were making it big, Bill and Blue Heather were learning their craft from listening to their great harmonies. So in addition to this fabulous list of entertainers, Blue Heather will be featured singing the song they recorded with SalSoul Orchestra years back. Thank you to Billy & The Essentials, Danny & The Juniors, The Dreamlovers, The Tymes, The Orlons and The Bluenotes for being a part of IMT and the inspiration to those who followed. Next week the Trump Boyz are back along with Dr. Lou and RT Funk Band. Due to some requests, we are bringing you encore performances from Nytrous and Volt. These bands have lots of fans that want MORE! Since they have not returned with new material as of this moment, here is what we have. Fans, let them know they need to return to IMT! Just a reminder. October 15, The Legendary Dobbs, The Philadelphia Music Scene ROCKS for Paul Kurrey. Check it out and I’m sure you will want to be a part of this awesome evening with some amazing bands! Thanks for watching IMT and enjoy your weekend! Don’t miss a chance to support our wonderful sponsors who play such a big role in keeping local original music on TV! It may still feel like summer, but autumn events are starting to come together. Beginning with IMT‘s new fall format and continuing with preparations for the October 15th fundraiser for Paul Kurrey, it’s just an exciting feeling of making things happen. First our September 8 show will continue the Bill & Dr. Lou interview we premiered last week, with more info about the Philly & Delaware Valley music scene. Then all the acts this week are taped at different venues, with the Trump Boyz from the Hawk Island Marina in Delanco, NJ. and Dr. Lou from Dr. Lou’s Place. The Parachuting Apostles are coming to us from The World Cafe and Danny & the Juniors from The Coastline. Definitely an array of talent from interesting venues. Watch this episode now on YouTube! On to the September 15 show. The interview segment with Bill & Dr. Lou has more updates and insights on the Delaware Valley music scene. We have 2nd songs from Glenn Basham, John Cantamessa & The Main Street Band, Dave Weber with Donna Delany and Dr. Lou. We’ll be listing all the featured bands and linking to bands’ websites soon, so watch this post for more info about this concert–and don’t forget to save the date to see it LIVE! As you can see, this will be quite a night of entertainment! And as I said last week, IMT will be there taping for future shows. So I’m sure everyone will want to be a part of this historic evening! Come on out, have a good time while supporting our friend and fellow musician in his time of need. I want to thank everyone who watches and supports our show and our sponsors. We so appreciate all everyone does for us so we can continue to spotlight the talent of our fellow area musicians and singers. Hard to believe it is here so quickly, but this week’s show is the first of the new fall season. In this first show, we are introducing a new segment to the program. Each week we will try to offer a bit of information concerning the business side of the music industry in and around the Philly music scene. In this premiere segment, Bill & Dr. Lou discuss their experience while attending a meeting of the Philadelphia Recording Community (PRC). That interview will be continued on the September 8 show. This week we’re featuring songs taped 2 weeks ago at Dr. Lou’s from Glenn Basham and RT Funk Band. That was a fun night! Then from a taping at Hebe Music a few days later, John Cantamessa brought along The Main Street Band and what a great performance! The same night we enjoyed Dave Weber with Donna Delany. They sound fantastic together! A thoroughly entertaining evening! Watch our September 1 show on YouTube! Next week, along with our new interview segment, each act is coming to us from a different venue. On a beautiful August evening we caught The Trump Boyz at Hawk Island Marina in Delanco, NJ. Then on to Dr. Lou’s Place and a new song from Dr. Lou. In their premiere appearance on IMT, The Parachuting Apostles are performing at The World Cafe. And how wonderful to have as our special guests this week, Danny & the Juniors! We were lucky to catch them at a fundraiser a few years ago at The Coastline. Thank you to Joe Terry for permission to air their performance from that evening, sounding fantastic as always! Speaking of fundraisers, don’t forget the special fundraiser IMT will be covering on October 15. This event is for Paul Kurrey, to support him in his battle with throat cancer. We want to help him beat this “worst of all cancers that could affect a singer.” Not only is he ill, but this form of cancer also threatens his livelihood. Save the date, October 15, and come on out to the Legendary Dobbs, South Street, Philly, for an unprecedented 4PM opening. Stay until 6:30 for Happy Hour and acoustic performances. After that, even I don’t know as yet who is in the line-up. But I’m sure they’ll be lots of surprises during this very special evening for a very special artist. We will definitely keep you informed as we find out more each week! I think this is all the IMT news to date. Don’t forget to watch us on WMCN, and tell a friend! And if you like our show, why not thank our sponsors by supporting their businesses? Click here to see our full list of sponsors who play a huge role in keeping local original music on TV! Have a great Labor Day weekend and enjoy this unofficial end of summer! We decided to wrap up this exciting summer with a little from each of the events we covered the last three months. Our August 25 show begins with Blue Heather and Dan Casper from our Anniversary Concert in June. Moving on to July 4th, one more song from Tommy Conwell, with back-up by Throddle. It was the hottest day of the summer, but a nice evening of entertainment after the storm. Then we’re back to the rains of Hollystock, with one more song from Volt and the final song we were able to record that day from The Late Ancients. All these events happened right here in Burlington County. Pretty cool! Watch our August 25 show now on Youtube! September 1st begins our new fall season and adds a new interview segment to the show. We are trying our best to bring information about the Philadelphia music business to our artists. In the debut interview, Bill and Dr. Lou discuss their experience at a meeting of the Philadelphia Recording Community. Following the interview, we’re featuring Glenn Basham and RT Funk Band, recorded at Dr. Lou’s Place just a week ago. Last Sunday we were at Hebe Music, where we caught John Cantamessa, this time with The Main Street Band. What a great, tight sound! After a “long time, no see,” we got to see our old friend Dave Weber again. He came down to Hebe‘s to record with Donna Delany. He’s better than ever, especially in this performance with Donna. Dave, so wonderful to see you again! Remember, IMT wouldn’t happen if it weren’t for our generous sponsors. Click here to see our full list of sponsors and please patronize them to thank them for their support of local original music!